Emaroo is a free utility for browsing most recently used (MRU) lists of various applications. Quickly open files, jump to their folder in Windows Explorer, copy their path - all with just a few keystrokes or mouse clicks. Let me give you a few examples. Let’s assume you have pinned Emaroo to the first spot on the task bar so you can start it by hitting Win+1. If you want to open an Explorer window at the file location of the solution, you type Ctrl+E instead of Enter. If you know that the solution contains “foo” in its name, you can type “foo” to filter the list. Because this is not a general purpose search like e.g. the Search charm, but instead operates only on the MRU list of a single application, you usually have to type only a few characters until you can press Enter or Ctrl+E. 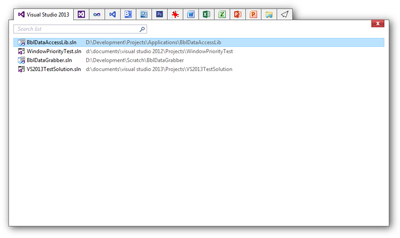 If you have several versions of Visual Studio installed, the context menu lets you open a solution in a higher version. Using the context menu, you can open a Visual Studio solution in Blend. 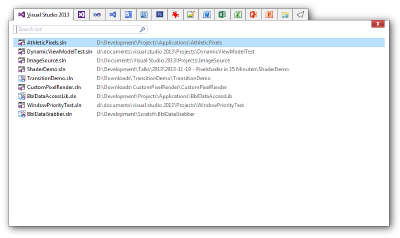 So far I have only mentioned Visual Studio, but Emaroo knows about other applications, too. It remembers the last application you used, you can change between applications with the left/right arrow or accelerator keys. Press F1 or click the Emaroo icon (the tab to the right) for a quick reference. 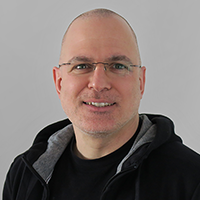 Which applications does Emaroo know about? Applications that are not installed aren’t shown, of course.